The 4 Cornerstones for Channeling Your Higher Self; Building a Practice of Inner Communication is included in the price of the Coached Collective along with its corresponding access to an experiential online environment of added resources including audio recordings, meditations, videos, journaling exercises and other resources. Are you an early adopter of new thought ideas? Do you seek cutting edge experiences? Become a charter member in the Coached Collectives, a program focused around your ability to engage in a facilitated group process of sensing, feeling, and working with the energy of others. Explore how to naturally bring to the groups’ awareness, the energies that are surfacing to be shifted, embraced or observed. In this pilot program we will co-create the structure and culture of this community built on deepening the awakening to our deepest, most divine selves. Explore a wide range of experiential tools for increasing your ability to open to energetic communication. Experiment channeling your Higher Self in a public, yet very safe, way. Co-create the structure that will support on ongoing, growing community. Charter members from the Pilot Program maintain their lower rate for as long as there is no break in participation. Experience magic when the collective consciousness of the group is channeled through various participants, bringing forward opportunities for coaching, learning and transformation to occur for each unique individual as well as, the collective as a discreet group, and as the potential for a more global shift. Learn a wide variety of experiential tools for accessing information. Step fully and naturally into high frequency states of being. Further develop your sensitivity and intuitive skills. Tap your unused capacity to sense subtle energetic communication. Experience yourself as a channel for others. Receive master coaching to support shifts that can instantly transform your life at the level of your readiness. Calls are recorded for future listening. Access to a library of past indexed coached collective calls. Create your own Coached Collective group of 4+ people who want to explore new frontiers of consciousness together. The synergy of an already bonded group can power extraordinary experiences and transformation! Whether your group is made up of family, friends or spiritual colleagues, everyone will alter the course of his/her life in highly personal and evolved ways. 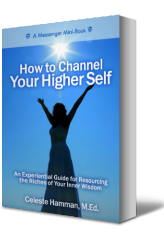 Contact celeste@channelyourhigherself.com for available days/times. Done with Individual Development? Evolving Together is the Answer. After Fat Tuesday Will You Take Off Your Mask? Supplicate & Surrender, Can I? Can You? Do You Make a Difference in Our World?